Are you aware of the safety hazards that may be lurking around every corner of your home? The family room rug that keeps bunching up or the light bulb that’s out in the hallway may seem like small annoyances, but can quickly turn into safety hazards for you or your senior loved one. The month of June is dedicated to home safety and raising awareness about the safety concerns in your own home. Take some time this month to implement these few simple steps to make your home safer. Check all rugs for slip resistance. Remove or replace any rugs, runners or mats that bunch or slip. Check all electrical cords. Do not run cords underneath mats or across pathways. Rearrange furniture, if necessary, to ensure cords are not a tripping hazard or fire hazard. Inspect outlets. Call an electrician immediately if you notice any exposed wires or heat coming from an outlet. Safety Proof Bathroom. More slips and falls happen in the bathroom than any other room in the house. Install non-skid mats, grab bars, and a bench in the shower to reduce the risk of falling. Elevate the toilet seat and install grab bars on either side allowing for seniors to get up and down easily. Replace lighting. Check lighting throughout the house, including entrance ways, hallways, and stairways. Replace any burned out bulbs. 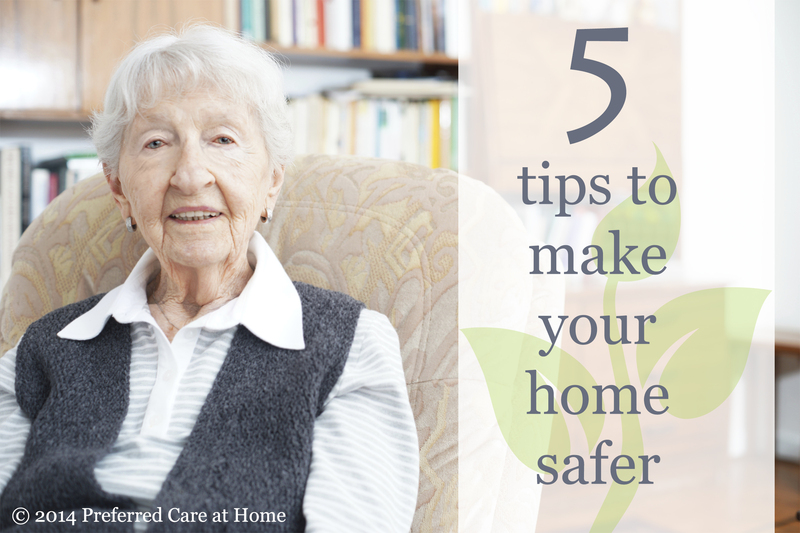 These five tips are just a starting point to safety proof you or your loved one’s home. Preferred Care at Home understands the importance of having peace of mind in the home you love. Because of that, we offer a complimentary 53-point home safety check to provide you with important information you need to ensure your home is safe. Contact a location near you to learn more about home safety. Throughout the month of June, Preferred Care at Home will be providing more information on home safety on our blog and Facebook. Share with us the steps you are taking to ensure your home is safe.